for singers, musicians and lovers of the musical arts! A clef (a french word meaning key) is a musical symbol used to indicate the pitch of written notes. Placed on one of the lines at the beginning of the staff (five lines stacked upon each other), indicates the name and pitch of the notes on that line. This line serves as a reference point by which the names of the notes on any other line or space of the staff may be determined. The Treble Clef’s curl wraps around the second line up on the staff indicating G above middle C, most commonly used in the staff for piano. 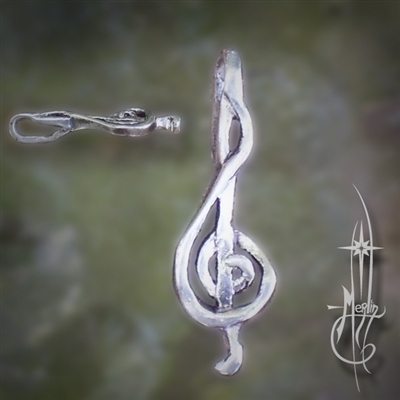 It is one of three kinds of clef used in modern music notation: F, C, and G.
One inch tall, this three dimensional Treble Clef Amulet has a bail behind the top loop so the pendant looks like it is “floating” on your chain or chord. This small pendant is a great way to celebrate your love for music! Whether you play an instrument, sing or simply love music, the Treble Clef amulet is perfect for the music lover in your life.